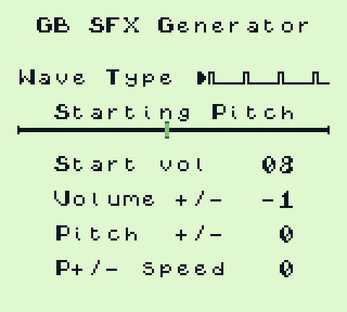 GB SFX Generator is a small tool for creating authentic Game Boy sound effects. It was created using the Game Boy Development Kit, and takes advantage of the Game Boy sound chip to make all kinds of bleeps and bloops for you to use in your own (non-Game Boy) games. Just open up the .gb file in any Game Boy emulator, then fiddle around until you make a sound you like, then record it to your computer's Line In. You can then use the resulting audio file as a sound effect in whatever project you're working on. The A button plays whatever sound you have created. The B button stops all sound. Press Up and Down on the D-pad choose different sound settings, and press Left and Right to change the values of the settings themselves. There are 4 wave modes (12.5% square wave, 25% square wave, 50% square wave, and white noise). The square waves can change pitch. Each kind of wave change change its volume, by setting a start volume, and having a volume change either positive (increase volume) or negative (fade away). The square waves can have sweep effects applied to them. 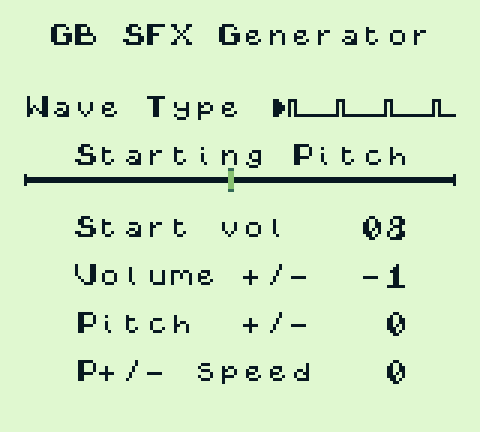 The vol +/- indicates which direction the pitch will change, and how much per audio step, while the +/- speed dictates how fast each audio step is (both have to be non-zero to work). Use these settings to create powerup effects, coin grabs, death or success sounds, etc. The noise channel also has some parameters that affect the way the noise is generated, though I'm not sure on the exact math behind it. Either way, experimenting with these values can create cool explosion effects. Any sounds you make are yours to keep. You may credit this app if you wish, but please let me know if it ends up being useful to you!